Forever Overhead, the debut album from singer-songwriter Tim Baker, features eleven songs that centre on kinship. His buoyant first single “Dance” was about a longing for connection and feeling close to, but ultimately separated from, love. 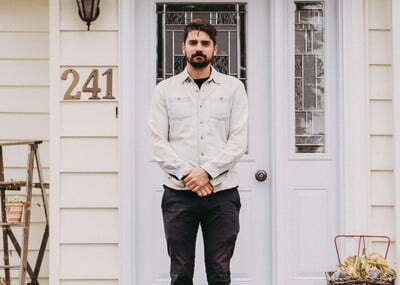 “All Hands,” his joyous indie-folk single, again explores connections, but is less of a lament than a thank you letter, dedicated to the people who have helped Baker throughout his career, and part nostalgic anthem about his Newfoundland home. Forever Overhead, is produced by Marcus Paquin (The National, Local Natives), and set for release on April 19, 2019 via Arts & Crafts. The album was announced in February alongside the breezy lead single “Dance” with a beautiful video directed by Tim’s long-time friend and fellow Newfoundlander Jordan Canning (Schitt’s Creek, Baroness Von Sketch). The video, shot in the Canadian Museum of Nature in Ottawa, further examined our modern dissociation and desire. Drawing upon this unique setting where nature is frozen in time behind glass, the video speaks to how increasingly disconnected we are from nature and the people in our lives, even when they are right in front of us.